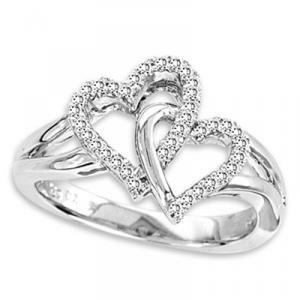 Home » Rings » Fashion Rings » Double Heart Silver Ring With Diamonds. Double Heart Silver Ring with 0.11 ctw diamonds.Two hearts and twice the glitter. Our Sterling Silver White Diamond Double Heart Ring has a flash that will make any Valentine’s heart flutter.This double heart ring is a winner any time of the year. Perfect for a heart promise ring!